McConigley is working on a novel set in Wyoming and India. 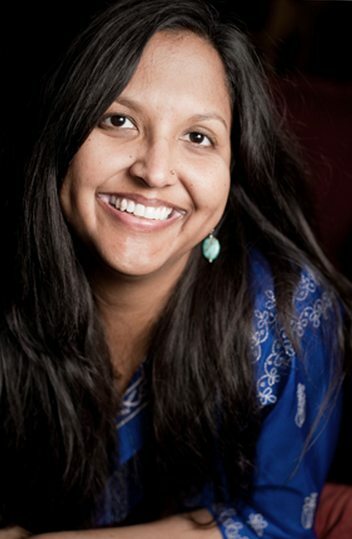 WASHINGTON, DC: Indian American writer Nina McConigley is the recipient of a $5,000 PEN Open Book Award for her collection of short stories “Cowboys and East Indians”. McConigley’s collection of short stories, titled “Cowboys and East Indians,” was one of two PEN Open Book Awards given. The other winner was Ruth Ellen Kocher for her work, titled “domina Un/blued.” McConigley is an English Lecturer at the University of Wyoming. Winners will be honored at the Literary Awards Ceremony on September 29, at The New School in New York City. Formerly the Beyond Margins Awards, the PEN Open Book Award offers a $5,000 prize to an author of color for book-length writings committed to racial and ethnic diversity within the literary and publishing communities. Works of fiction, literary nonfiction, biography/memoir, poetry and other works of literary character are strongly preferred. Published by FiveChapters Books, “Cowboys and East Indians” is a collection of short stories set in Wyoming that explores the immigrant experience and the collisions of cultures in the American West. Several stories in the award-winning book began when McConigley was working on her M.A. thesis with UW Professor Alyson Hagy. McConigley says she took some of her first creative writing classes at UW, said the press release. Born in Singapore to Irish and Indian parents, McConigley grew up in Casper. She holds a master’s degree in English from UW, a Master of Fine Arts in creative writing from the University of Houston, and a bachelor’s degree in literature from St. Olaf College in Northfield, Minn.
McConigley also has been nominated for a Pushcart Prize and the “Best American New Voices.” Her play, “Owen Wister Considered,” was produced in 2005 for the Edward Albee New Playwrights Festival. She was the 2010 recipient of the Wyoming Arts Council’s Frank Nelson Doubleday Memorial Writing Award and was a finalist for the 2011 Flannery O’Connor Short Fiction Award. Her work has appeared in the New York Times, Virginia Quarterly Review, American Short Fiction and the Asian American Literary Review, among others. In an interview to NBC, McConigley talked about how her family moved to Wyoming. Her father is a petroleum geologist, and she was born in Singapore. When her family moved Casper, Wyoming, she was 10 months old. Her mother, Nirmala Swamidoss McConigley, was the first Asian-American woman elected to the Wyoming state legislature, and she ran for the U.S. Senate. In India, her mother, a journalist, had worked for All India Radio, and later was the news director of a TV station in Casper, Wyoming. When she won her House seat in Wyoming, there wasn’t one South Asian in her district. She is now working on a novel, which she revealed is mostly set in Wyoming in the 1980’s. “The book revolves around two families that live together in an extended family situation. There is a murder and a chunk of the book takes place in India. It’s not a mystery per se, but I am indulging my deep love of Agatha Christie, which makes me very happy,” said McConigley.